Neville, who owns the 258-acre Capstone Farm in Henry County, says his three real stewardships in life are to the land, to livestock and to people. Neville first gained notoriety as the first KY EXCEL Farm Program Member for his work in 2016 with 52 Kiko/Savannah cross goats in brush control on his farm. KY EXCEL is the Department for Environmental Protection’s environmental excellence program. It recognizes the voluntary environmental improvement projects of both the regulated and non-regulated communities in Kentucky. Last year, the program decided to add a new membership category for farms, and KY EXCEL Farm Program was born. Known as Kentucky Dawgs, these dogs debuted at the 2016 Kentucky State Fair and have taken off since then. 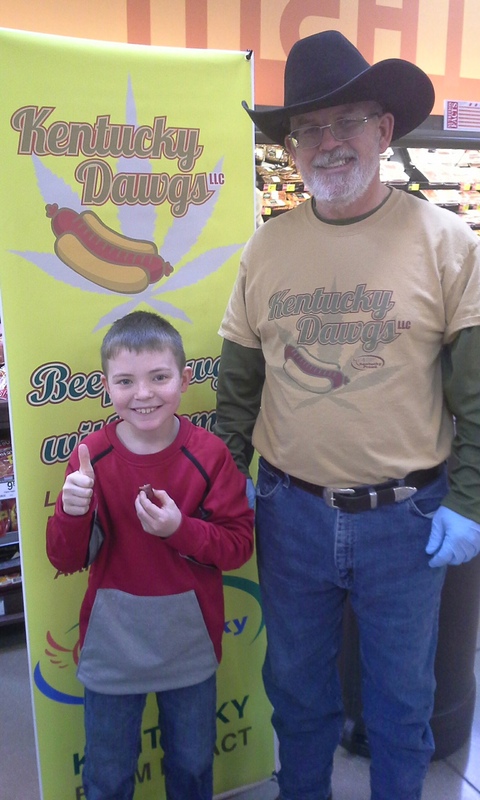 Renowned for their basis of removing junk filler and replacing it with hemp extracts, these dogs are now in over 50 Kroger’s across the state are making their way into state schools, and even across the U.S. High in protein and low in sodium, these healthy wieners are filled with amino acids and Omega 3’s, 6’s and 9’s. The hemp gives the dogs a nutty flavor and a much better consistency than a normal dog, which is made mostly from scrap meat. For this year’s KY EXCEL project, Neville plans on working with Steve Higgins, Director of Environmental Compliance for the Agricultural Experiment Station with the University of Kentucky. Together they plan to analyze ways that his cattle operation can run more smoothly, in harmony with the environment and in ways that benefit the both the consumer and the land. KY EXCEL Farm seeks to recognize farms that go above and beyond to help protect, maintain and enhance the Commonwealth’s environment, while providing food to tables across the state. The program is working to recruit more farms in order to have a robust networking and mentoring community that will encourage other farm operations to adopt practices that will protect and enhance the environment. Currently, there are only four members. These include Capstone Farms, Thomson Ag, Kentucky Beef Network and Warren Beeler. Photos from top to bottom: David Neville poses with one of the students that attends a school that eats his Kentucky Dawgs. Some of Neville’s Kiko/Savannah cross goats and his working dog work a pasture to clear it from weeds and invasive plants. Neville’s beef cattle line the fence row on his Henry Co. farm. Neville poses with Agriculture Commissioner Ryan Quarles. Photos courtesy of David Neville.